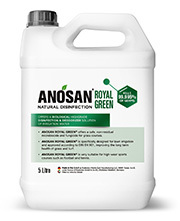 ANOSAN ROYAL GREEN® powerfully removes bacteria, viruses, fungi, spores and algae through biological disinfection of irrigation water – making it ideal for golf courses, football fields, and sports venues with turf without halting course use. Water is a limited resource, ANOSAN ROYAL GREEN® helps in disinfection of recycled water to eliminate the usual contaminants of microbes. Without this disinfection common complaints would include unwanted odors, poor root growth, algae contamination, and spread of “black layers”. It’s specifically designed for lawn irrigation and approved according to DIN EN 901, improving the longterm health of grass and turf. Using ANOSAN ROYAL GREEN® in irrigation also prevents the accumulation of biofilm in irrigation systems keeping pipe maintenance low, and removing contaminants in irrigation water increasing the health of crops. In addition, golfers and athletes can be at risk to inhaling unwanted spores leading to allergies and illness.